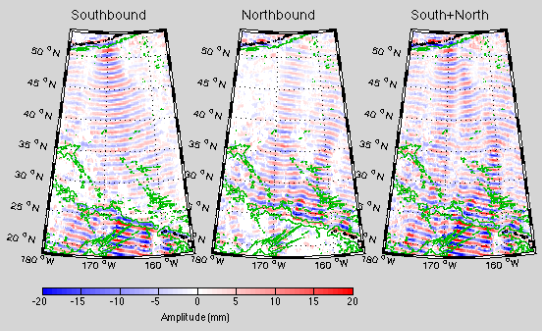 Zhongxiang has used his multi-satellite technique to separate the long-distance propagating waves from the Aleutians and Hawaii. In the movie, the southbound and northbound waves are seen separately at left and center. Remember that these are data, not a model! Notice how they each travel over 3500 km - to cross the entire basin. The two wavefields together (right) is much more confused, showing a complicated interference pattern. The following two figures show a zoom-in of these fields around Hawaii.